Today the California Academy of Sciences achieved a groundbreaking feat of sustainable design as the U.S. Green Building Council presented it with its second LEED Platinum certification, making it America’s first double platinum museum, and the world’s largest double platinum building! The green-roofed museum designed by Renzo Piano continues to perform to the highest sustainable standards three years after it received its first LEED rating. Find out more about what makes this building so remarkably green right after the jump! The devastating 1989 Loma Prieta earthquake in California severely damaged the original 158 year old academy building in Golden Gate Park, giving the organization a chance to start over. So they took their time (a full ten years) to create a super energy-efficient green-roofed building that includes an aquarium, a planetarium, a natural history museum, as well as a world-class research and education program. 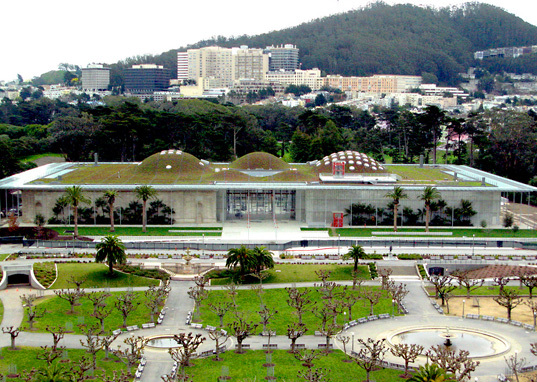 The first LEED Platinum rating was awarded based on the building’s superior design and construction, but the latest certification under the USGBC’s “Existing Buildings: Operation & Maintenance” category acknowledges the incredible strides taken to ensure that every aspect of the museum’s day-to-day operations are as earth-friendly as possible. Of the 80 points available, the Academy received an unprecedented 82. This is for achieving the very best marks in sustainable sites, water efficiency, energy use and atmosphere, materials and resources, indoor environmental quality, and innovation in the design process. Here are a few specific highlights: 100% of the building’s computers are energy star-rated and 100% of the paper used in the building is composed of post-consumer recycled content. Up to 65% of the Academy’s waste is recycled or composted (including the waste of the 5 million visitors who have walked the lush corridors to date), and 70% of the staff use alternative transportation to get to work. 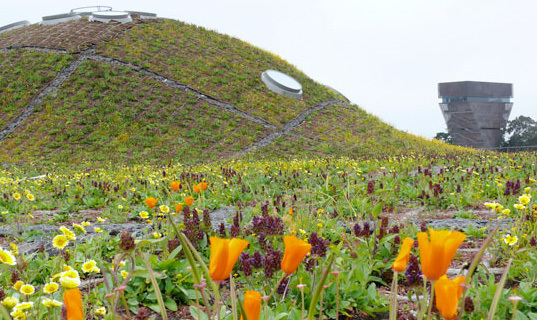 The Academy uses 32% less water than the average building, while 100% of the roof and 80% of the surrounding landscape consists of indigenous vegetation. Finally, the Academy continues to share their learning and love of nature with ongoing education programs. This is definitely a crowning achievement that the rest of the world can look to for inspiration. Today the California Academy of Sciences achieved a groundbreaking feat of sustainable design as the U.S. Green Building Council presented it with its second LEED Platinum certification, making it America's first double platinum museum, and the world's largest double platinum building! The green-roofed museum designed by Renzo Piano continues to perform to the highest sustainable standards three years after it received its first LEED rating. Find out more about what makes this building so remarkably green right after the jump!